The giveaway has ended. Winner has been announced below. Dead spots in your house? Can’t make a call without it dropping? Today is so your lucky day. I am going to talk about 2 different answering systems that I’ve tried out and love. First up is the VTech Connect to Cell™ cordless Bluetooth telephone ($60). VTech has come out with a new line of phones they like to call theirConnect To Cell answering system. You don’t even need a land line for this… I should know! I don’t have a land line and the phone works perfectly. Your cellphone can connect to the system by using bluetooth. It is super easy to pair with the system and in a few seconds you are ready to go. 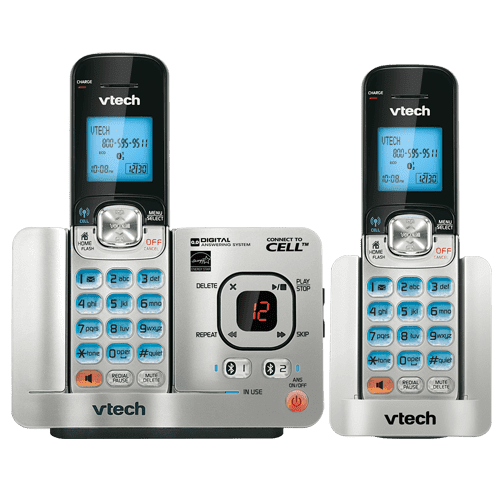 VTech says you can make and receive cellular calls with the ease and comfort of a home telephones system — avoid the mad dash to catch a cell call before it goes to voicemail. VTech Connect to Cell™ cordless Bluetooth telephone allows you to connect your cell phone to the phone system. Their cordless Bluetooth phones are the perfect solution for cellular only households as landline service is not required! The version I have is the DS6521-2. Access your cellular phonebook directory – Download your cellular phonebook directory to this cordless phone system. Dial a landline or cellular call from the directory for easy access. Stores over 200 directories from up to two different cell phones – no need to input names and numbers into your cordless phone. Expandable up to 5 handsets using only one phone jack. Excellent range, up to 500 feet. You will only be spending $59.95 as they offer FREE SHIPPING on their website. If you have issues with using your cellphone at home, this system is for you. 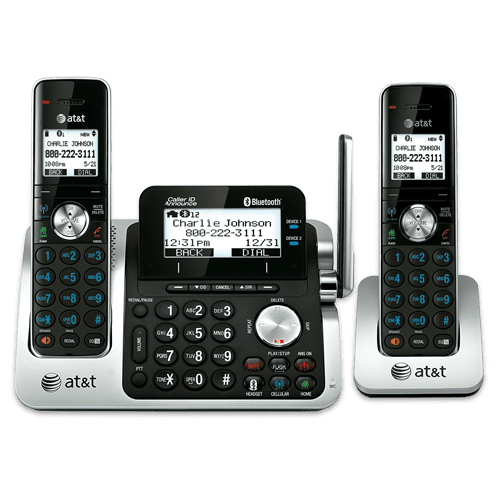 The 2nd option I’m talking about today is the AT&T TL96271 Connect to Cell system ($80). This is my absolute favorite answering system and I use it daily. The AT&T TL96271 DECT 6.0 telephone with its push for talking mechanism involves the use of DECT’s 6.0 technology. Also facilitating connection to cell phones having by means of Bluetooth; the 2 handset cordless telephone enables downloading of six thousand cellular phone entries. The entries download into the handset. Enabling digital recording of fourteen minutes’ time; the expandable cordless telephone gives you the freedom to shift between cell calls and those coming from home or landline. The PTT placed on its side serves the use of AT&T Tl96271 DECT 6.0 telephone like an intercom. The provision for caller’s information details is another of its advantageous features. Equipped with a quality audio one of the biggest advantage of this handset lies in its easy accessibility to multi pronged communication. As soon as I opened up the box, I grabbed the quick start guide and began reading. It took me about 3 minutes to set up and link my cellphone to the phone case. It was quick, easy and most of all, painless. Now, whenever I receive a phone call on my cellphone, the answering system rings as well and I can choose to answer it on my cellphone or on the home phone. The great thing about it is – if you have dead spots on your house, you can use this as a great alternative. No more “can you hear me now” because chances are, the person on the other end will be asking you that. You won’t have to worry. That’s right! I was able to secure this awesome answering system to give away on the site. This is one of my favorite tech gadgets and we would love the opportunity to give one away to you. * Do you have a phone with bluetooth capabilities? If so, this phone will work for you! 2. Make sure you are following us on Facebook andTwitter to stay up to date with the latest. Winner will be chosen at random on Friday, May 25th. Must be 18+. ALL THE time! This would be AWESOME!!! !” We will contact you shortly. I received these phones to review. All opinions are my own. Originally published on 2012-05-21 by Moms at Modern day Moms .